Looking to start an online business? Don’t have a dime to spare? Let’s look at how to start a business for free online! Here’s the thing, you can start making money online without investing a cent. Now I’m not saying it’s easy. I’m not saying I have done it myself. But I have read people doing it and I do have one great idea for anyone willing to try. I want to make it completely clear this is not the way I started my business myself. My business is still (as of writing this post) in its infancy and it’s just starting to produce traffic. I’m still holding on to a day job, so I have some cash to spare and I have invested few hundred bucks in to my online business. But if you are in a situations where you have some time to work on an online business but can’t really invest any money on it just yet I might have solution for you. I’ll have to warn you, it takes work. It always does. And when there’s no money involved there usually a bit more work involved. That’s just how it goes in life. If you can’t invest money, you have to invest time. 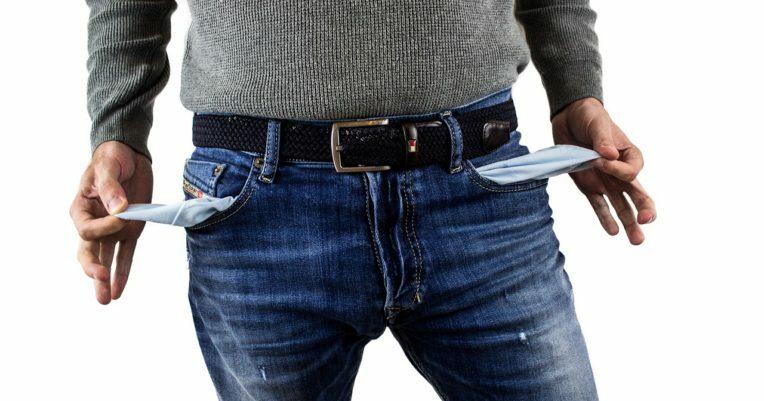 How is it possible to start a business without money? Yeah, I know it sounds crazy. That you could actually start a business without investing a dime? Because of the internet, it’s possible. Of course establishing a real registered business is going to include some paperwork and fees. The great thing about making money online is the fact that you can start making income before you have to worry about that stuff. Here’s the thing. Any conventional business takes a crap ton of money to get started. From a coffee shop to a machinery to a IT consulting firm it takes thousands and thousands to get everything going. You need facilities, machinery, employees, computers, cars, inventory and god know what else before you have made a dollar. This is not the case with online business. It’s about selling information or marketing other companies products as an affiliate and getting an affiliate fee. One way to start making money from scratch is to get affiliate referrals through free to register channels like Facebook, YouTube, Instagram etc. Any place that allows you to share content for free with you followers. Once you have made enough referrals to earn $50 or so you can reinvest that money to buy a domain and start creating content. Since Wealthy Affiliate offers everything you need to run an online affiliate marketing business, I will use them as an example for using this model. You could in theory replicate this by promoting almost anything from Amazon products to customer leads to companies. You could then reinvest that money to either buying a domain on some other service to create a niche website or maybe just buy some direct traffic to an offer. The ways are many but this is the one I’m familiar with so It’ll have to get the point across. The first step would be to create a free account in Wealthy Affiliate. You automatically join the built in Wealthy Affiliate affiliate program. The free subscription allows you to complete the first chapter of both trainings in Wealthy Affiliate and also to host two free .siterubix sites. 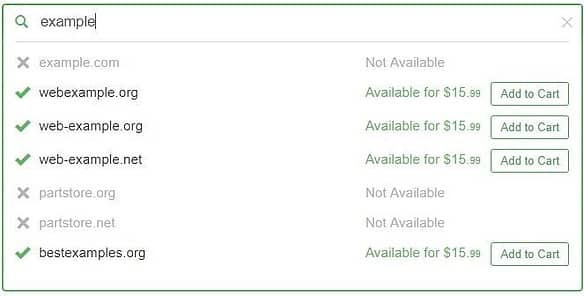 These are possible, but hard to rank in Google so you could in theory make money with them for free as well. You also get to do 30 keyword searches on Jaaxy lite. This is enough to get you started in content creation if you use it wisely. I wrote an extensive review here, so you might want to check that out so you know what you are getting yourself into. Registering for the free account doesn’t require a credit card. Just you email and they are not aggressive with the marketing so it really isn’t a big deal to register to check it out. If nothing else, check out the free courses to get some ideas about how to make money online. But for our current objective, I have something else in mind. You see, as of writing this, you get $11.45 for every referral that upgrades to premium. That means if you can get 4, just 4 referrals, you will make enough money to pay for the monthly premium subscription. How do you get referrals if you don’t have a website with traffic? Well you have to get a bit creative and it probably takes some work. There are plenty of free channels to use these days like Youtube, Facebook, Instagram, Twitter etc. If you have a channel with any kind of following that could solve you problem. If you have no accounts and no followers, then it’s time to start working. Create something that interest people of socialize in YouTube channels. You could even employ real life marketing. You could market the service to you friends, family or colleagues. I know this can seem a bit awkward, so make sure you know the service and trust it so you can recommend it with clean conscience. But that’s how you get started without ANY money. If you have even a few bucks to spare you have much more options. So you have now referred four people to WA that have gone premium. Great. The next step is to invest that money to go premium yourself. As a premium member you affiliate fees are doubled, so you need to refer only two people that go premium to pay for you monthly subscription. Going premium allows you to complete the training the teaches you a lot about making money online. It’s not the be-all-end-all solution, but it’s a model that works. You should focus on learning one thing at a time. The premium membership also includes the keyword ressearch tool Jaaxy lite version. Which gets us to our next step. Once you have you premium membership set up follow either the Affiliate Bootcamp or the Internet Entrepreneur Certification and choose a niche. At this point it would be wise to invest $13.99 – $15.99 to buy a domain for you own site. You could accomplish this by getting one extra referral if you really don’t have cash to spare. This is a once a year fee so it’s actually dirt cheap. Once you have you niche and domain figured out it’s time to activate you site and install WordPress on it. After that it’s time to start creating content and follow the training. To create meaningful content that can rank in Google, you need to do keyword research with Jaaxy lite which is inluded in you premium membership. Jaaxy allows you to do unlimited amount of searches, so it’s time to get creative and start coming up with keywords that are related to you niche. You now have you own website set up and you have created a bunch of posts on low competition keywords. Since it takes time for a new site to start ranking in Google, you will need a source of income while you are building you site. This means you have to keep getting two more referrals to WA every month to cover most of you expenses as you get $22.5 per referral as a premium member. If paying $49 a month is too steep for you I’m guessing you don’t have a job. This means you probably have more than average amount of time (I get there are situations where this isn’t true) to dedicate to creating content and building you business. Otherwise, I honestly recommend getting a job while working on you online business. It takes time and you must have other expenses as well. This means you might achieve better than average results but don’t expect to start making any money at least before the 6-month mark. Give it a year if you want to be conservative. So you now have you own site, you have enough content to start ranking in Google and you are receiving traffic to some profitable keywords. It’s time to find a way to monetize you site! You could drive traffic to Wealthy Affiliate if you are following the Bootcamp or for example sell Amazon products related to you niche. The ways are many. At this point you should be making enough money to cover you hosting and membership costs at Wealthy Affiliate. At this point the sky’s the limit. Just keep creating high quality content to scale you business up. If you wish to continue with Wealthy Affiliate you can. You get a great hosting service, a keyword research tool and a great community to share you problems with. There you have it. A way to make money online for free. I’m not going to lie to you and say it will be easy. To succeed with this you would have to dedicate some serious time marketing WA memberships through other channels. It’s not as easy to get people to convert to premium membership as you might think. It also requires you to create high amounts (several per week) of high quality posts if you wish to start making money at the 6-month mark. I’m going to go as far and say that it would be easier to get a part time job to cover you expenses than to try and pull this of. If you growing business depends on the affiliate fees, you whole business is extremely vulnerable. So get the resources, start working hard and succeed! This is just an idea. If you are a blogger or an internet marketer or thinking about becoming one, you need a hosting service for your websites. Wealthy Affiliate is an all-in-one online resource for marketers that includes a state-of-the-art hosting service aimed specifically for running WordPress based niche websites for marketers. 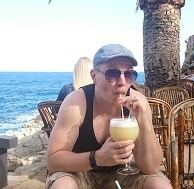 I wrote an extensive review about Wealthy Affiliate here. However the hosting service is so packed with features and the price is very competitive that I decided it needed a review of its own. So without further ado, let’s get cracking and see how well the Wealthy Affiliate hosting service stands up to the competition! In case you are new to internet marketing or website hosting I thought it would be good to write couple words about what exactly is a website hosting service. If you are already familiar with this stuff feel free to skip to the next paragraph for the review. There are millions of websites on the internet. Every single one of those websites are located on a host. A host is a server (or actually a series of them) where the actual physical data of the website is located. A website hosting service is a service that sells or rents server space to host your domain and website content. Just like the name says, duh :). Hosting services have many more important functions like database support, data backup in case of physical storage failures. This means you don’t have to have physical backups on your home computer if the service is up to par. Modern hosting services also make sure their security is up to date so you don’t have to worry about getting hacked on the server side as long as you keep your websites up to date as well. Most hosting services also offer tools like email boxes and forwards, integrated content management systems and domain registration services. So in essence a website hosting service can be just rented server space with database support where you upload your site files manually. Most of the popular ones you want to use as a marketer include lots of tools. Wealthy Affiliates web hosting service is no different on this so let’s check out some of the features! Wealthy Affiliate membership includes hosting for 25 of your own domains plus 25 FREE websites. 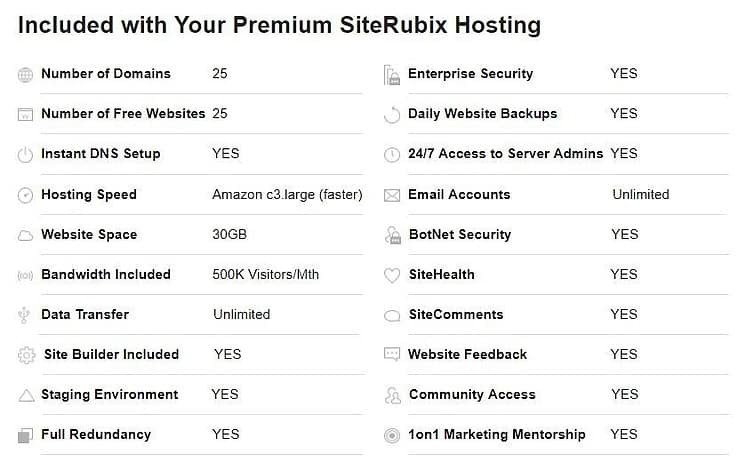 The free domains come with a .siterubix domain and are great for testing or for hosting small personal sites not aimed for public distribution. Be aware that the free websites don’t rank very well in search engines compared to paid domains (though, its possible to rank them) so they really serve best for testing. You have to naturally pay the registration fees for your own domains. The registration fee is $ 13.99 – 15.99 / year. There are no up sells and the registration process is very simple and fast. There is 30 GB of server space included for your websites. Nothing to complain here. 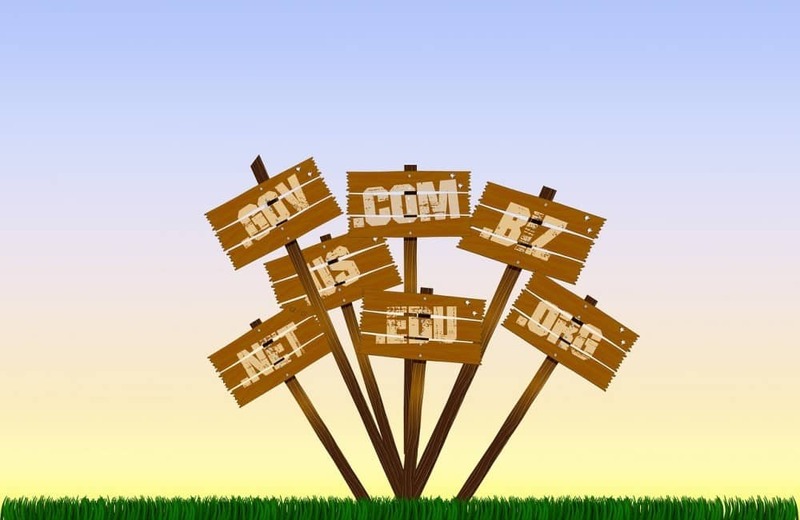 One of the great things about the domain registration service is that it looks for alternative domain names and suffixes if the one you want isn’t available. The whole Wealthy Affiliate service and its tools are fully integrated. This means you can actually do keyword research with Jaaxy (lite version included) and see if the exact match domain for a keyword is available. You can then register the domain with couple clicks. This is a feature especially marketers and anyone knowledgeable in SEO will appreciate. As the internet is evolving, research engines are giving more and more importance to user experience. Site loading speed is one of the not so obvious, yet one of the most important factors for positive user experience. People hate slow sites and for that reason, Google hates them too. Search engines appreciate good user experience. That’s why it extremely important to use simple page design, compressed pictures and avoid using too many plug-ins on your site. But even if your site is optimized to the perfection, it doesn’t matter if your website is hosted on a slow server. Many cheap web hosting services that seem good on paper otherwise are cheap because they are located on slow and cheap servers. Speed costs money you see. Wealthy Affiliate uses Amazon hosting servers that are located on the latest and most powerful server in the world. The average page load time in WA web hosting is only 1.3 seconds. This is excellent by anyones standards. These days most hosting services have pretty stable server uptimes. Because even few minutes of website downtime can cost a company thousands, hosting services do their best to keep all the websites hosted on their servers up and running. While most hosting services have gotten the downtime to few hours per year, Wealthy Affiliate offers full website redundancy. They accomplish this by having a constant mirror of your site in case of server failure or maintenance. If your actual site goes down, the mirror is swapped over instantly. This is something that should not be taken lightly. Like I said, any downtime on a successful marketing site can mean the loss of thousands of dollars in revenue. This kind on website uptime is really unparalleled and state-of-the-art technology. The fact they have included this in their modest pricing is incredible! All domains purchased through Wealthy Affiliate web hosting SiteDomains service have privacy protection included. This is something you usually have to pay extra $10. It protects your personal information from identity thefts, spammers and your competition. This is something you want to use these days no matter where you decide to host your site. WordPress is a great platform for bloggers and marketers as it requires close to zero technical skills to publish content. It is however notorious for getting hacked, because bloggers and webmasters forget to keep their WordPress and plugins up to date and hosting services have had issues with WordPress security on their end as well. This is something you don’t have to worry about with Wealthy Affiliate. The whole hosting platform is built from the ground up with the aim to offer the best WordPress platform around. The company really knows WordPress and its security issues. This means they are able to prevent spam and hacking completely. One great feature of WA hosting is daily backups. This means if you manage to delete something valuable on your site or whack everything up while running an update, they can help you return a fresh backup copy of your site. The WA web hosting is geared towards marketers building niche websites using WordPress content management system. It’s without a doubt the best and most comprehensive service for THAT use. If you dislike WordPress for some reason, you will lose a lot of the functionality of WA web hosting. There might be better services available for you that allows you to choose your content management system. Experienced webmasters who like to write their own code and have the possibility to trim and tune ever small little detail on their site, databases and servers, might find WA too integrated. It’s geared towards simplicity and time efficiency, not technical versatility. Then again if you are an experienced webmaster you probably won’t end up reading this review. Well, here comes the best part. It’s actually one of the cheapest (serious) hosting services. There are cheaper ones but they don’t really offer the speed and security that a successful site or a blog requires these days, so I won’t count them. 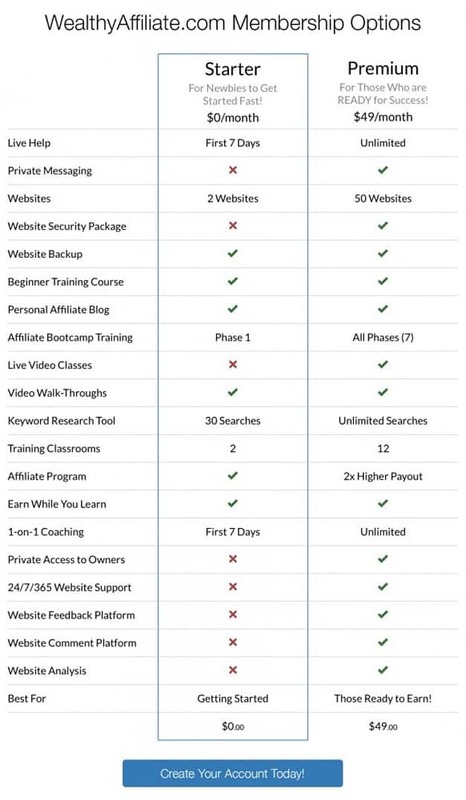 The monthly subscription of Wealthy Affiliate costs $49. This might seem a bit steep at first glance especially if you are looking to run a single blog or site. Do take to account the price remains the same even if you are running the full 50 websites (except for the annual domain registration fees). But there’s more! If you take the yearly subscription the price drops to $359 / year which equals $29.90 / month. Talk about a big discount. But wait there’s even more! If you want to get the subscription for super cheap, you can usually get the yearly subscription for $299 during the black Friday weekend. This drops the monthly cost to $24.90. BUT WAIT! THERE’S EVEN MORE! Actually there really isn’t. I just like being dramatic and I’m not very good at selling. I’m sure you can tell :). Or actually there is. You can actually test Wealthy Affiliate for completely free without even giving any credit card information. 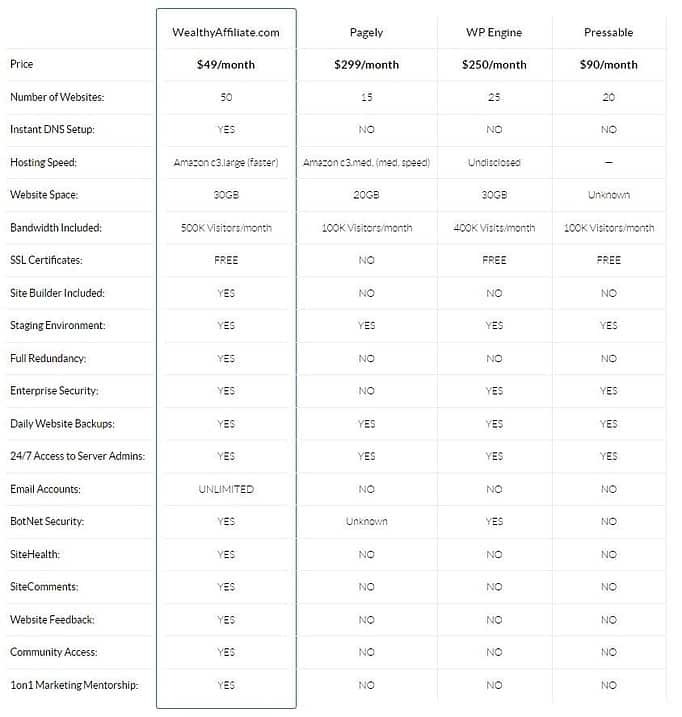 As you can see, the WA web hosting is pretty far ahead of the competition when it comes to the features and bang-for-the buck. It has the biggest amount of websites, fastest hosting, most bandwidth and unlimited email accounts just to name few of the perks. The Wealthy Affiliate web hosting that comes as part of the Wealthy Affiliate premium subscription is the best hosting service for marketers or anyone looking to build fast sites with easy to use interface. With all the tools from keyword research to marketing training it really is a no brainer to go with Wealthy Affiliate. If you are a marketer or a blogger looking to build sites without all the hassle then I can recommend Wealthy Affiliate wholeheartedly! Let them take care of the technology so you can focus on your business. Time is money after all! Nothing takes take fun out of running an online business like battling with technology. If you have any questions or comments please share them below and I promise to answer them asap.